I don’t know about you, but I’m always looking for the next greatest kitchen appliance to revolutionize the way I cook. I’ve convinced myself that if I’m not healthy enough, it’s because I didn’t have the right blender to make smoothies in the morning. I’ve determined that if I can’t get dinner done on time, it’s because I don’t have the right gadgets to help me multi-task. And I’ve also resigned myself to the fact that my sandwiches will never cut it if I don’t get a panini press, plain and simple. So what keeps me from picking up these miraculous meal transformers? For one, my husband, who thinks I already have plenty of small kitchen appliances on hand (what does he know…he does, however, make a good point that we may be running out of cabinet and counter space). But the more pressing reason is that it’s hard to spend my hard earned money on something that might revolutionize one area of my life, but not another (such as the rice cooker I’ve had my eye on). Well, that last reason is no longer a concern of mine and it doesn’t have to be a concern for you either because, during the Macy’s Black Friday in July Sale this month, there are 20 kitchen appliances you can get for just $9.99 after mail-in-rebate! I can truly say nothing will stand in the way of keeping you from becoming a breakfast hero with these deals. Think about it: during this special, you can get almost five of these appliances for the regular cost of one! And if you determine that you already have enough gadgets and small appliances in your kitchen (though I can’t imagine who would), these would be great to pick up for wedding or housewarming gifts. 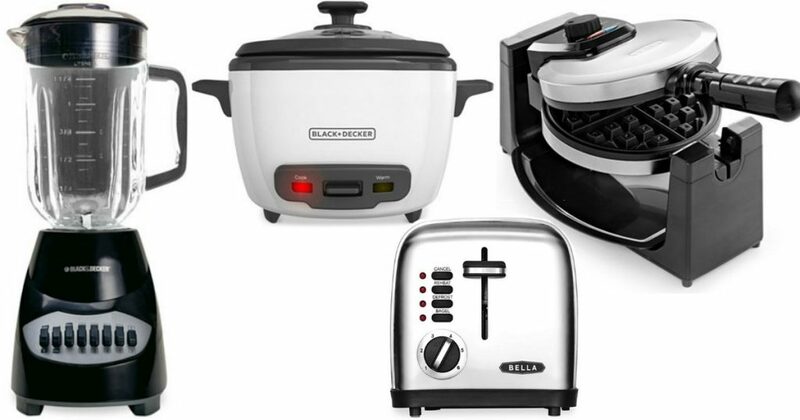 There are technically 33 small kitchen appliances you can get for $19.99 during this month’s Black Friday in July Sale, but only 20 of them have the additional rebate so you only end up paying $9.99. You can get all the details on the 20 kitchen appliances for $9.99 here.